Howard. Hampton. It’s an HU thing. You might not understand. I do. I’ve been there and done that. When these two historically black universities go at each other, there is a lot more going on than school pride. There’s always a battle being fought within a war, a game within a game. It doesn’t matter what the setting is. Debate team competition. Battle of the Bands. Cheerleading. It could be on the football field where the two schools met up last Saturday at RFK Stadium to play in the AT&T Nation’s Football Classic. The battle cry over which school is the real “HU” is more than hyperbole. These are fighting words. And these cats mean it. As a graduate of Howard University, I can you first hand that the Hampton and Howard rivalry is not something to sniff at. Yes, we know about the rivalries of Duke-North Carolina, Texas-Oklahoma, Florida-Florida State, Alabama-Auburn, USC-UCLA, and many others around the country. All rivalries put up a lot of huff and puff bravado, draw fictional blood with gamesmanship, invite standoffs in intellectual tug-o-wars, and carry on rich traditions. This is what makes going to college fun. School pride is real and embodied triumphantly in college students’ respective schools. The rivalry between Howard and Hampton go beyond that. But in a good way. It’s the swag. It’s the culture. It’s the social environment. It’s the academic pedigree. It’s the sororities and fraternities. It’s the pride of knowing your school is one of the best around. Howard is often referred to as the “Mecca” of historically black colleges and universities. Hampton, with its beautiful and calming backdrop of the Chesapeake Bay, is well-known for its business curriculum. As a matter of fact, both schools rank as the best HBCUs have to offer. U.S. News & Report’s 2017 HBCU rankings has Howard at No.2 and Hampton at No. 3. With the schools basically geographic neighbors with roughly three hours of mileage separating them, it is no coincidence these universities would be battling and vying for the cream of the crop student talent, academically or otherwise. When it comes to delivering prominent African American men and women who have inroads to changing the landscape of this country and abroad, Howard can go toe-to-toe with any school. The roll call can get pretty lengthy. Thurgood Marshall, Kamala Harris, Richard Smallwood, Roberta Flack, Toni Morrison, Ossie Davis, Jessye Norman, Taraji P. Henson, P. Diddy, Chadwick Bozeman, and Stokely Carmichael among others. There are some impressive names on the other side as well, including Booker T. Washington, Wanda Sykes, Rick Mahorn, Ruth E. Carter, Dorothy Maynor and Spender Christian, all of whom have done Hampton proud. The Howard-Hampton clash on the football field carry on that tradition of notable alumni. Antoine Bethea, Ronald Bartell, Steve Wilson and Marques Douglas have represented Howard at the NFL level. Ditto for Darian Barnes, Johnnie Barnes Reggie Doss and Jerome Mathis, all of whom went to the next level as former Hampton Pirates. 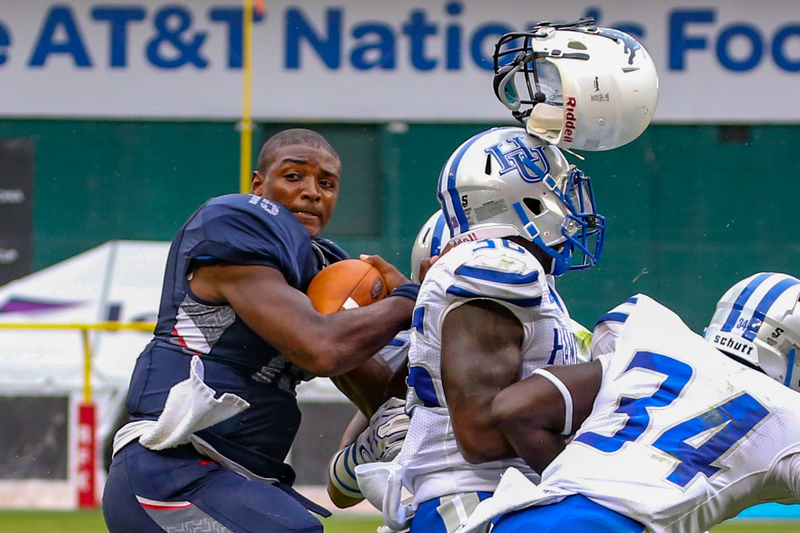 The Howard-Hampton tango continued its annual dance on the gridiron in the 2016 version of the AT&T Nation’s Football Classic on Saturday, Sept. 17. Unfortunately for the Howard Bison football team, it turned out to be not the kind of day they were hoping for. 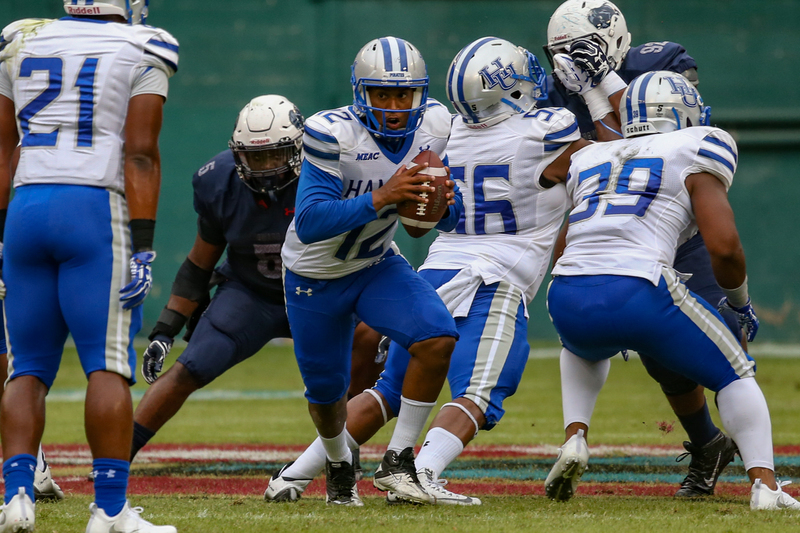 With Hampton already holding a slight edge in the longtime running series between the two universities, Howard had a day it would rather forget, dropping a 34-7 decision to the Pirates. Getting points for the Bison during the first three games of the season has a been a challenge for coach Gary Harrell and his team. The points became really scarce against Hampton as Howard did not reach the scoreboard until late in the fourth quarter. If you judged this game by the numbers, the two teams played almost evenly. In the time of possession category, Hampton won out with a 30-29 edge in minutes. The Pirates managed a slight 16-13 lead over the Bison in first downs. 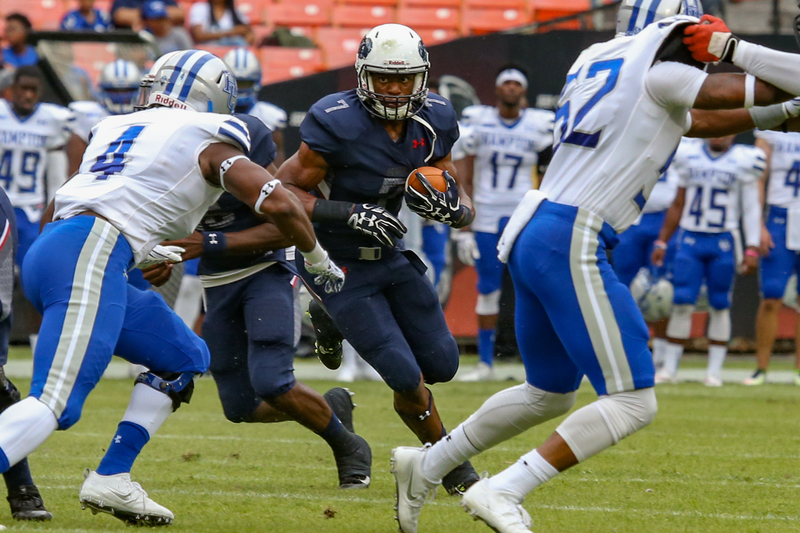 Howard outgained Hampton in rushing, gaining 235 yards on the ground, while the Pirates generated 215 yards. What done in Howard was not converting on third downs (5-14) and the lack of a passing game (97 yards), if stats mean anything. On the flip side of things, giving up 423 yards and a 24-point scoring burst in one quarter (Hampton scored 24 points in the third quarter) won’t help you win too many ballgames. About the only good thing Harrell and the Bison can take away from this MEAC Conference defeat was the successful 1-2 running platoon of Jason Collins and Anthony Philyaw. Collins rushed for 98 yards on seven carries. Philyaw contributed 83 yards on the ground. Hampton, which received scoring input from six players, petty much had a balanced offensive attack in winning its first game of the season.